The story of an Indian Expat: There are around 10 million expats living in Saudi Arabia. They come here for better working opportunities, however, things do not always go as per plans. Sometimes death meets the fate and all the dreams and plans are left behind. Expats who come here alone in search of a job never think that they would die here, yet many are destined to die here. Similar is a story of an Indian expat named Koya Moochi Kadavanpaikt. He was 54 years old living in Saudi Arabia for 22 years. It had been 12 years since he last visited his home-town. He died in 2015: According to his passport’s finding, he belonged to Kozhikode district in Kerala in India. In 2015 he complained about chronic illness and was taken to Al-Khobar’s private hospital. He could not battle his disease and die in the hospital. The hospital authorities tried to contact the family so that they could collect the dead body, yet as no one showed up even after several days, thereby, the body was shifted to government’s hospital morgue. The case was studied by the police and the hospital authorities. The Saudi Authorities figured out the person through a social media campaign: They then contacted Nass Shoukat Ali Vokkam. Vokkam is a social worker in Dammam who tends to find the relatives of the dead ones. A statement released by Vokkam says that he along with the government authorities tried to search Koya’s family in India as per the passport details but were unable to do so. They even ran a media campaign for locating the family, but nothing proved fruitful. Finally, social media came to rescue, and a social media user was able to identify the deceased and told that he was a resident of Kasargod district bordering Karnataka state. The family didn’t know about his death: The family was then told about the tragic incident. The family was unaware of the death. They informed that they had been waiting for their loved one since years so much so that his three younger brothers had delayed their marriages. They and their mother wanted the marriage to be held in Koya’s presence. The mother of the deceased died waiting for her son while the three brothers kept on delaying their marriages. Poor mother, she could neither see her son before her death nor could see the marriage of her younger sons. He was buried in Saudi Arabia: The Family allowed the Saudi Authorities to bury the deceased in Saudi Arabia. 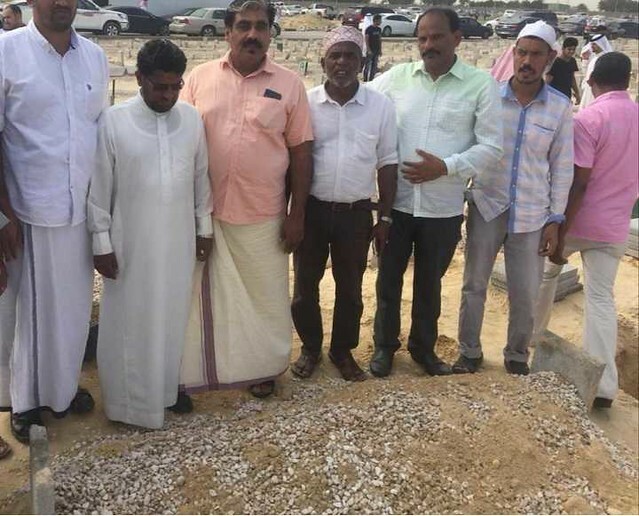 Finally, after three years of his death, the Indian expat had been buried this Friday in Saudi Arabia.